Four prospects playing for Boston University have left school to turn pro with their NHL clubs. Big end of season exodus from Boston University: Farabee (PHI), Oettinger (DAL), Krys (CHI) and Fabbro (NSH) all turning pro. Joel Farabee, the 14th overall pick of the 2018 NHL Draft, joins the Philadelphia Flyers after just one season with BU. Farabee recorded 36 points (17 goals, 19 assists) in 37 games and was named Hockey East rookie of the year. 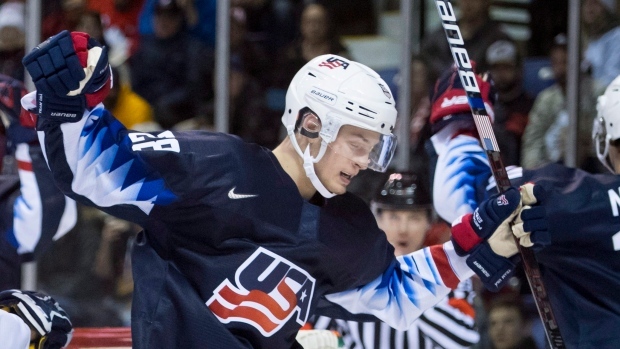 According to TSN Senior Hockey Reporter Frank Seravalli, Farabee is expected to rehab a recent injury in Philadelphia and join the Flyers' AHL affiliate, the Lehigh Valley Phantoms, for their playoff push. His entry-level contract will start next season. Expectation is Farabee will rehab recent injury in PHI, hope to join @LVPhantoms for playoff push. His entry-level contract begins next season. The Dallas Stars have officially signed goaltender Jake Oettinger to a three-year, entry-level contract. He will report to the AHL's Texas Stars on an amateur tryout for the rest of the season. He appeared in 36 games for BU this season, posting a .926 save percentage and a 2.45 GAA with 16-16-4 record. Oettinger was the 26th overall pick of the 2017 NHL Draft and concludes his BU career tied for first in program history with 13 shutouts, while he ranks second with a .923 SV%, fourth with a 2.34 GAA and fifth with 58 wins in three seasons. Defencemen Dante Fabbro and Chad Krys also leave after three seasons at BU. Fabbro, BU's captain, recorded 33 points (seven goals, 26 assists) in 38 games this season. He was the 17th overall pick in the 2016 draft by the Nashville Predators. Krys recorded 20 points (eight goals, 12 assists) in 30 games this year and was a second-round pick (45th overall) of the Chicago Blackhawks in 2016. He has signed his entry-level deal with the Blackhawks and will report to the AHL's Rockford IceHogs. Boston University's season ended on Mar. 22 with a 2-1 loss in the Hockey East semifinals against Northeastern University.